Download "ClickCartPro Software Installation README"
5 Once you have configured your administrator account and have configured any applications installed, you will want to view the front-end content provided by the software. This is what your Internet site visitors will see when they interface with the software. To access the front end script, simply open your web browser and browse to the location of the 'index.php' script you uploaded earlier. Example: UNIX/LINUX INFO Change PHP INI values using.htaccess file under Apache webserver: The software does a very good job of trying to set all PHP INI values on it's own, but some are directory controlled. Some server administrators allow for you to change directory controlled PHP INI values by using a.htaccess file in the root web directory. Because specific.htaccess file contents vary in different Apache versions, we recommend you use whatever.htaccess format your server administrator recommends to set the required PHP INI values. Change the software's default permissions level (777) for script created files and directories: The files and directories created by the software and software installer are set to permissions level '777' when they are created to allow for easy FTP access to the files. If you would like to change this default permissions level to a more restrictive level, edit the values for the 'perms_level_files', 'perms_level_dirs' and 'perms_level_config' variables in the files: /home/account/www/xcs/admin.php /home/account/www/xcs/index.php /home/account/www/xcs/installer.php Be sure to test your installation after making such a change to ensure the permissions level entered is appropriate. COPYRIGHT NOTICE 1999-Present GreenbarnWeb. The ClickCartPro software is copyrighted, trademarked, developed, distributed under license and supported by GreenbarnWeb (Greenbarn Consultants Ltd.). ClickCartPro (CCP) User s Guide 1999-Present Kryptronic, Inc. All rights reserved worldwide. Kryptronic, the Kryptronic logo and all Kryptronic software names and logos are trademarks of Kryptronic, Inc. 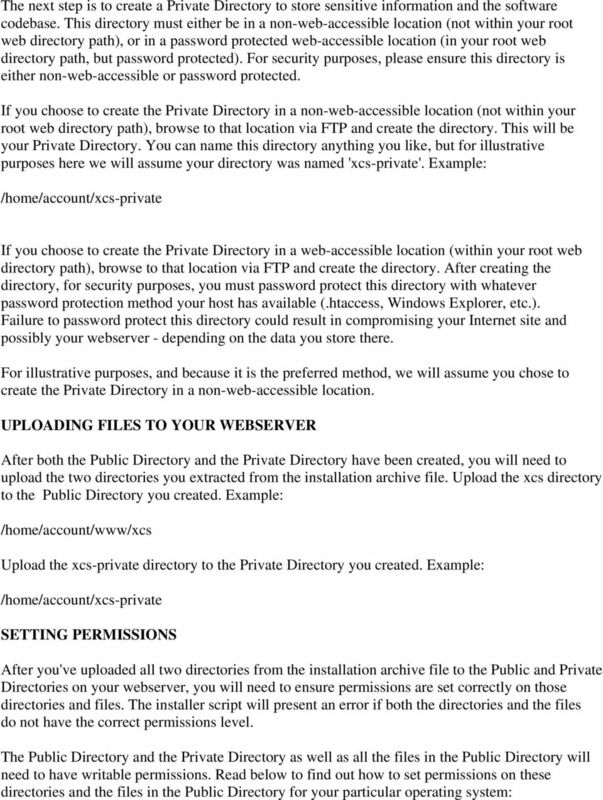 Installing buzztouch Self Hosted This step-by-step document assumes you have downloaded the buzztouch self hosted software and operate your own website powered by Linux, Apache, MySQL and PHP (LAMP Stack). The Web Pro Miami, Inc. 615 Santander Ave, Unit C Coral Gables, FL 33134 6505. T: 786.273.7774 info@thewebpro.com www.thewebpro. Getting Started Guide Parallels Plesk Panel 11 for your Windows Server Getting Started Guide Page 1 Getting Started Guide: Parallels Plesk Panel 11, Windows Server Version 1.1 (11.1.2012) Copyright 2012. Sitemap. Component for Joomla! 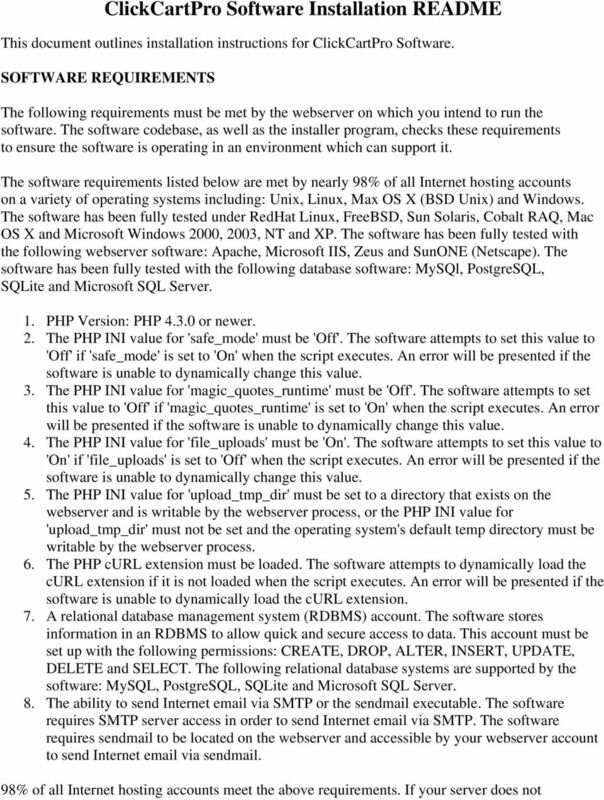 This manual documents version 3.15.x of the Joomla! extension. http://www.aimy-extensions.com/joomla/sitemap. Getting Started Guide. Getting Started With Your Dedicated Server. Setting up and hosting a domain on your Linux Dedicated Server using Plesk 8.0. Fasthosts Customer Support MySQL Quick Start Guide This guide will help you: Add a MySQL database to your account. Find your database. Add additional users. Use the MySQL command-line tools through ssh. What will be supplied with chemoventory package? Quick Start Guide Joomla! : Guidelines for installation and setup. Why Joomla! This installation guide will help you install your chosen IceTheme Template with the Cloner Installer package. Getting Started Guide. Getting Started With Your Dedicated Server. Setting up and hosting a domain on your Linux Dedicated Server using Plesk. Getting Started Guide Parallels Plesk Panel 9.2 for your Windows Server Getting Started Guide Page 1 Getting Started Guide: Parallels Plesk Panel 9.2, Windows Server Version 2.2 (1.6.2012) Copyright 2012. This guide consists of the following two chapters and an appendix. Chapter 1 Installing ETERNUSmgr This chapter describes how to install ETERNUSmgr. 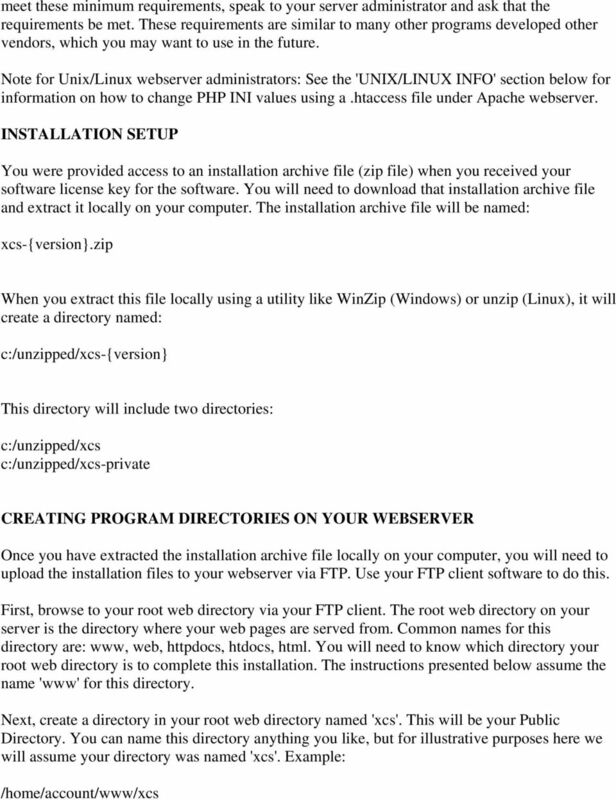 What is WS_FTP Server Web Transfer Module?...1 System Requirements...2. What is WS_FTP Server Web Transfer Module? Installation Guide. . All right reserved. For more information about Specops Deploy and other Specops products, visit www.specopssoft. Installation Guide. . All right reserved. For more information about Specops Inventory and other Specops products, visit www.specopssoft.
. All right reserved. For more information about Specops Inventory and other Specops products, visit www.specopssoft.com Copyright and Trademarks Specops Inventory is a trademark owned by Specops Software.